They're pretty much what you expect from UGG boots but I have to confess to being a bit underwhelmed. The fit was not fantastic - my heels were slipping, even though they were a snug fit at the toe. 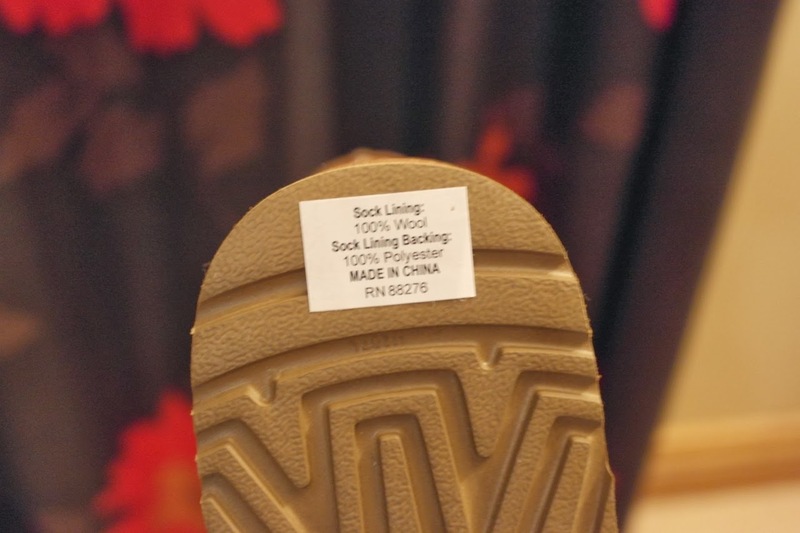 They were over £100 after all and I think I was just expecting more...what exactly, I don't know but this sticker on the sole was the first thing that put me off - Made in China & 100% Polyester Backing?? UGGpure is the latest addition to the UGG collection of premium materials. It’s a luxurious, natural wool woven into a durable backing that enhances the overall product experience. Featured in linings and footbeds of select products, UGGpure allows us to deliver a plush sensory experience with every wear. I feel more than a bit cheated! 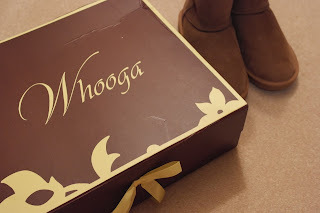 One slight problem and one of the reasons I've not linked directly to the Whooga site is that they have no stock at the moment. Not sure what that's all about - you may want to keep an eye on the website to see if that changes in coming days. And a note of caution - I didn't find them the most communicative company to deal with - I actually ordered two pairs and returned one and it was a lengthy process with very little contact from the company and a pricey insured parcelforce return bill, so if you buy, try to avoid doing a return! It was a world apart from the excellent free return service at Daniel - complete with regular emails advising on the progress of my return. 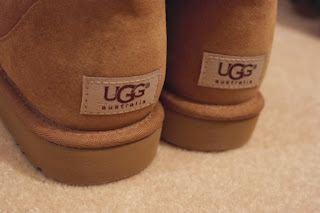 So tell me - do you have Uggs? 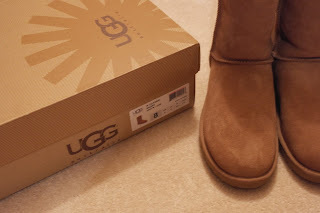 UGG Australia ones or alternatives? Do let me know in the comments below. And if you hate them, I understand. I used to too but now my warm feet are so happy and I'm a changed woman! 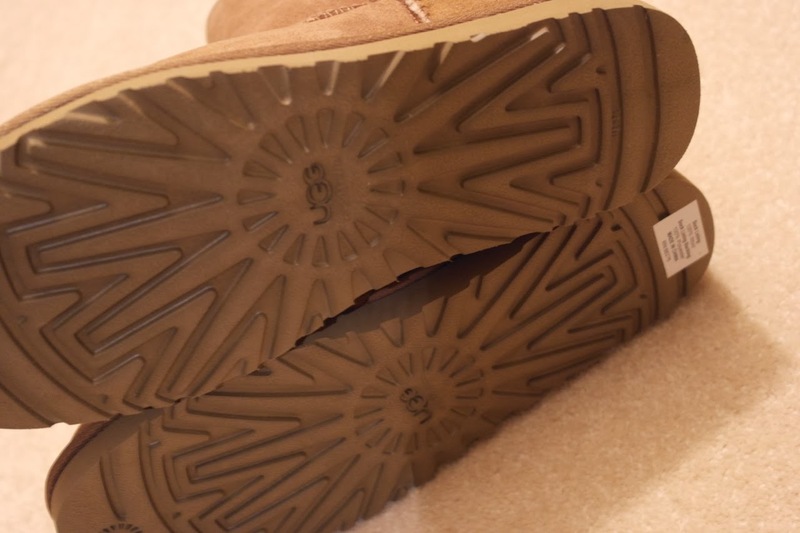 UPDATE - I've just found this article about UGG now making their boots with a lining to cut production costs. This will hopefully answer a number of emails and comments telling me I might have fakes, I can confirm once again - the ones I bought from Daniel ARE genuine UGG Australia. 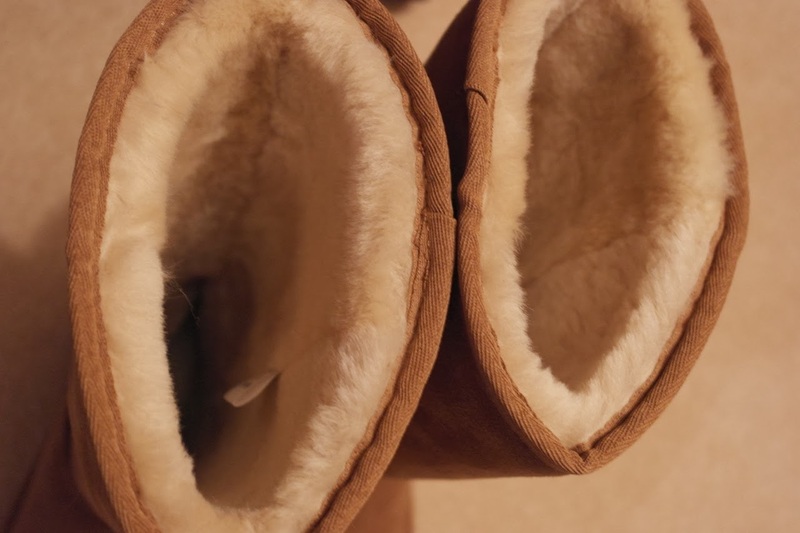 Be careful when buying in the future - you're looking Twinface sheepskin - not UGG Pure! They look such a great alternative. I have the Australia UGGs in the chestnut, long length, and also very underwhelmed! The biggest issue is the lining keeps slipping down inside, not what you expect for the money. They have lasted quite well and still look good but I wouldn't buy another pair. Great saving you've made! Real Uggs don't have lining - they are sheepskin, so the inner fleece is just the back of the skin. I guess the fit is dependent on your feet - they fit my hobbit feet like a glove! Sorry - I wasn't saying your wern't real - it was in response to the comment above about the lining slipping. Interesting to see they've changed how they are made. Mine are old, but I am awaiting a new pair to arrive, so will have to see how they compare. i have emu's, they are great. like avril has said, i only wear mine indoors so can't vouch for how waterproof they might be. i got mine from tk maxx, long length navy, and they were reduced to £39. 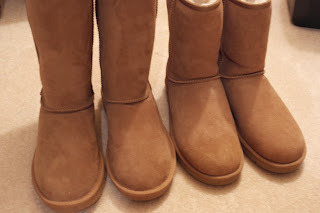 I just can't get on with UGGS - at all. I have seen them worn so badly by others that I am put off. You do not wear them incorrectly can I just say! I think your alternatives are BRILLIANT! I have to say I wouldn't dream of buying a pair of real Uggs for indoor wear as that effectively makes it an extremely expensive pair of slippers - ouch. 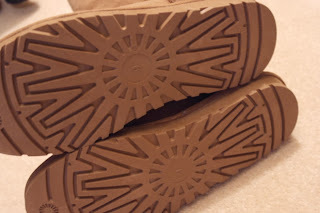 I have a pair of real ones in chocolate brown which for some reason actually rub a little on the ankle. I have a pair of not real ones which I wear outside which are the comfiest things ever and I can't throw them away as they are so comfy. 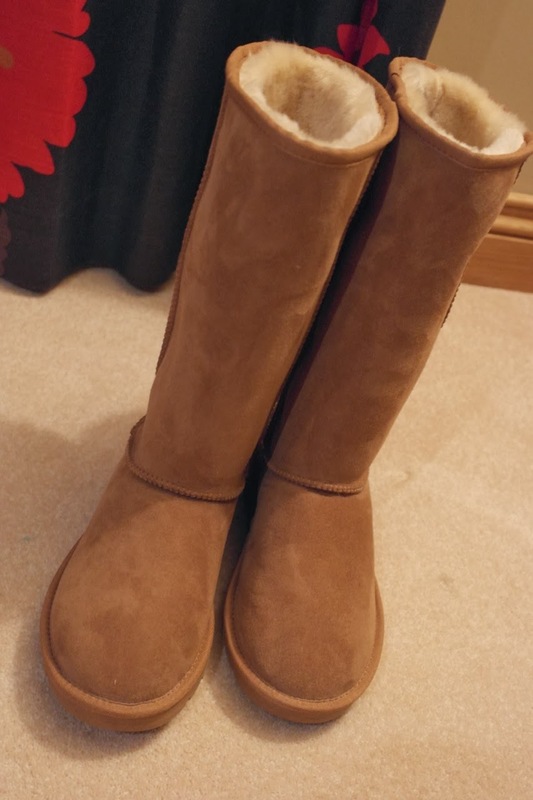 And I have the Ugg Kensingtons which is a palaver to get one and probably why they didn't continue them for very long as I know a lot of people who can't get them on. But for at home, I live in my Costco Kirkland kids sheepskin slippers. Every year they bring them out and every year, I buy myself a pair. I think I may even have over indulged one year and pushed the boat out and bought two :o) as I love and adore and worship them. I make an annual pilgramage for my pairs. 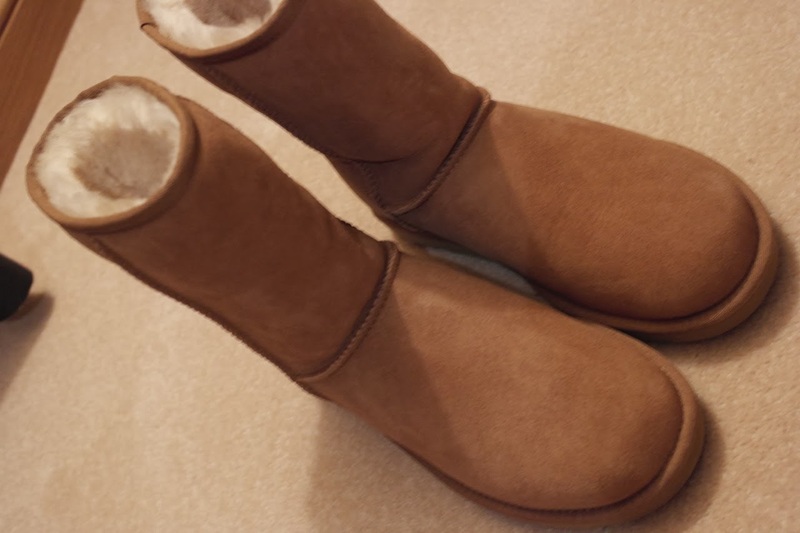 And they work out at less than £30 for real sheepskin (not the faux micro fibre) boot/slippers which give you good support. They are a wardrobe essential in my eyes. Err .. can you tell I love them? Not something I've considered before and am with you Avril, they'd be slippers for indoors, but given whooga are out of stock in pretty much all sizes and styles, they're on to something! I love your blog. As a mum of 2 obsessed with clothes I think it's brilliant! I found whoop a a few years ago and have had a few pairs, all been fine ! 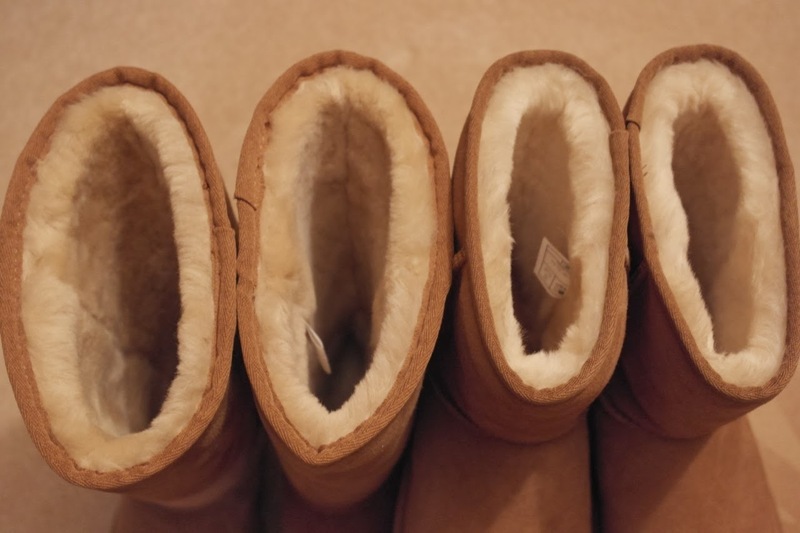 When I first arrived in the UK, I was horrified to see how expensive and popular Ugg boots were. They were plentiful in Christchurch (NZ) and cost no more than £40. In fact, Ugg wasn't really a brand until these guys decided to patent the name. 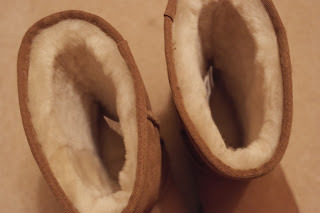 We used to just call these sheepskin boots Uggs (or fugly). My sister brought over a pair for me and the thick rubber tracks on mine are more suitable for snow. The price? Yup. £40! thats crazy how much the price varies! hello! thanks for your sweet comment on my blog, i do hope you liked what you saw? nice post! 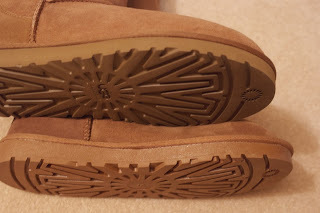 Uggs have been in the press a lot just lately after the Angora scandal. Sheep can be treated inhumanely when they are skinned for these boots . Maybe the polyester backings are in response to that issue. Just a thought. 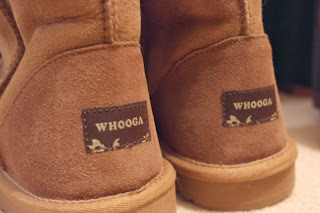 I got Whooga Uggs to a few years ago and they are still going strong. But did get an email last week saying that the company was going into Liquidation, hence the cheaper prices. My boots were gifted for review, but were still more than £100 at full price, but definitely worth it.